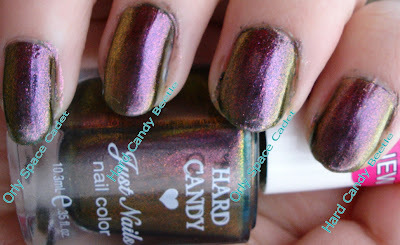 A couple of weeks ago Becky got a bit of a Hard Candy haul. One of these polishes was Beetle, which looked very, very familiar to me... we decided we had to do a comparison! As I am sure most of you are aware, Orly Space Cadet was one of the most popular and unique polishes from the fall Cosmic FX line. 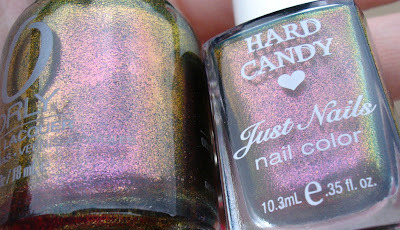 Now Hard Candy Beetle seems to be a dupe in the bottle - so we tested it out to see if it could hold up to Space Cadet's amazing duochrome shine on the nail! These were done on Becky's nails. 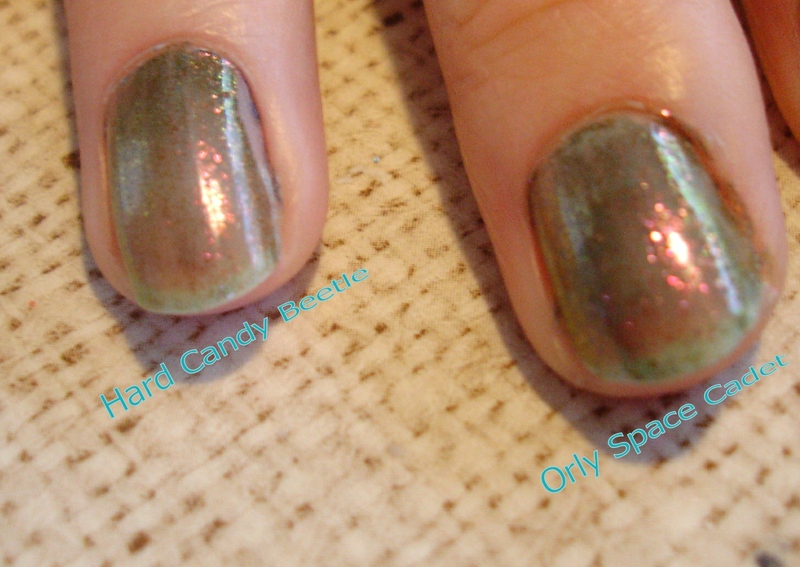 Above, you can see one thin coat of each polish, showing that they share the same greenish base color and very similar looks glittery shine. So far, these are looking pretty similar to me! I continued to add thin coats, coming up with a grand total of four coats of each polish - opacity continued to be the same for the two brands. I wonder what's with all the dupes lately...especially with the Cosmic FX Collection. I mean...every single polish in that collection has a twin in some other brand. Heck, Halley's Comet is a quadruplet, nevermind a twin. What the french, polish companies? 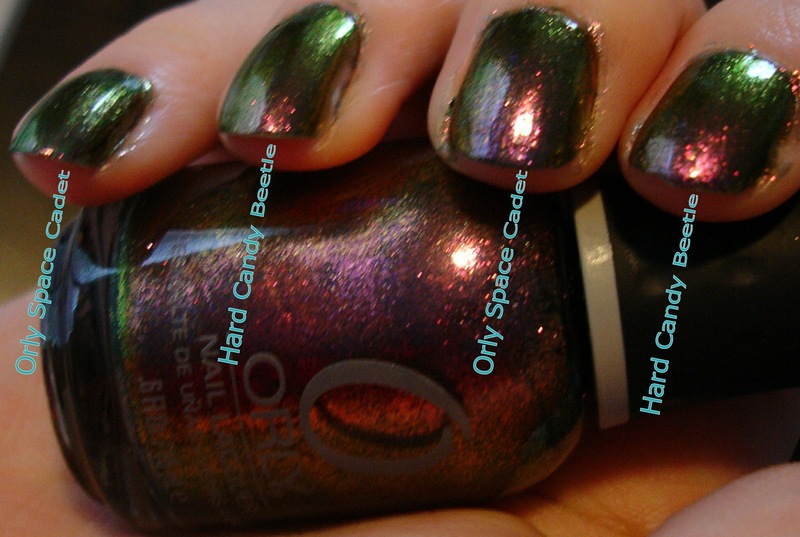 But with that said, I do think that Orly is the best value, in terms of amount of product and cost. Thanks for the awesome comparison!! Hahaha. Space Beetle! 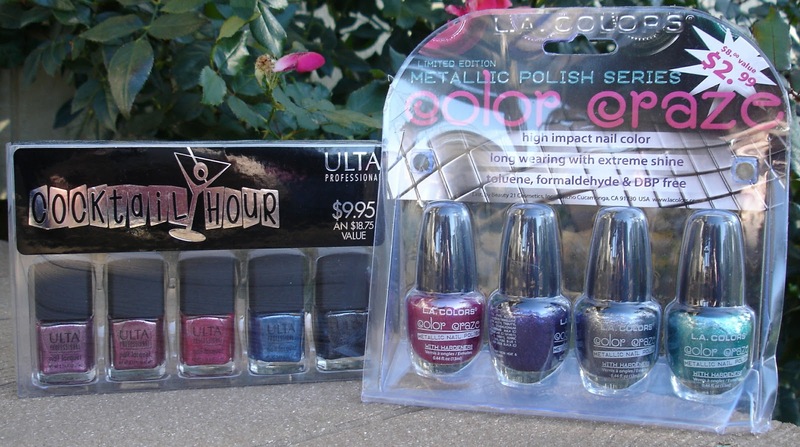 I love the idea of this color, but am not sure how much I actually like wearing the polish. I must be strange because this color seems to be so popular! I blogged about this in my sidebare, with a picture. I love the comparisons, they can kill lemmings! Glad you all found this one helpful! It is really interesting how many dupes there are out there for the Cosmic FX collection.